As some of you know my Birthday is coming up at the end of the month. I will be 23. Yay! 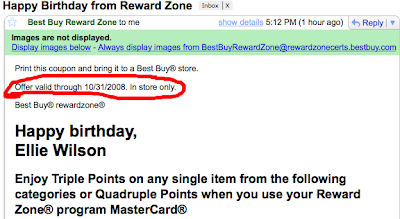 Well, about an hour ago I recieved an e-mail from Best Buy giving me a coupon to use for my Birthday. At First I was SUPER EXCITED! I was ready to head back out and go buy a movie I wanted (Sleeping Beauty). Then I read the Coupon again. It seems the coupon expires on October 31, 2008... Odd thing is I only just got it for the first time today! Not to mention my Birthday isn't until Nov. 29th. So whats the deal Best Buy? Seems Best Buy Falls under Epic Fail Coupon Stores now.